If you’re looking for South Dakota colleges, you visit the SD My Life website. The website is sponsored by the South Dakota Department of Education and is a comprehensive college planning website that requires registration through your high school for access to the most useful parts. The public section of SD My Life has links to testing resources, South Dakota specific scholarships, and public universities. There is a comprehensive college search function that does include private South Dakota Colleges but is available only to register users. Registered users can also complete a variety of assessments such as a matchmaker for interests, ability profiler for careers, and a learning style inventory. They can research a variety of careers and use a free test prep course. Everything is saved in a personal portfolio that users can share with parents and teachers. The Select Dakota website has planning timelines for high school students as well as an overview of scholarships and financial aid links. The site is limited to public institutions only. The transfer section has links to transfer equivalency options at public universities as well as information on transfer scholarships. The South Dakota Board of Regents website has more information on scholarships, loan forgiveness, and aid programs specific to South Dakota residents. It has a list of Articulation Agreements between public programs. There are 12 four-year South Dakota colleges with 500 or more full-time undergraduates according to the Integrated Post-secondary Education Data System. Approximately 17 percent of students attend one of the five private South Dakota colleges while 83 percent of students attend one of the seven state institutions. 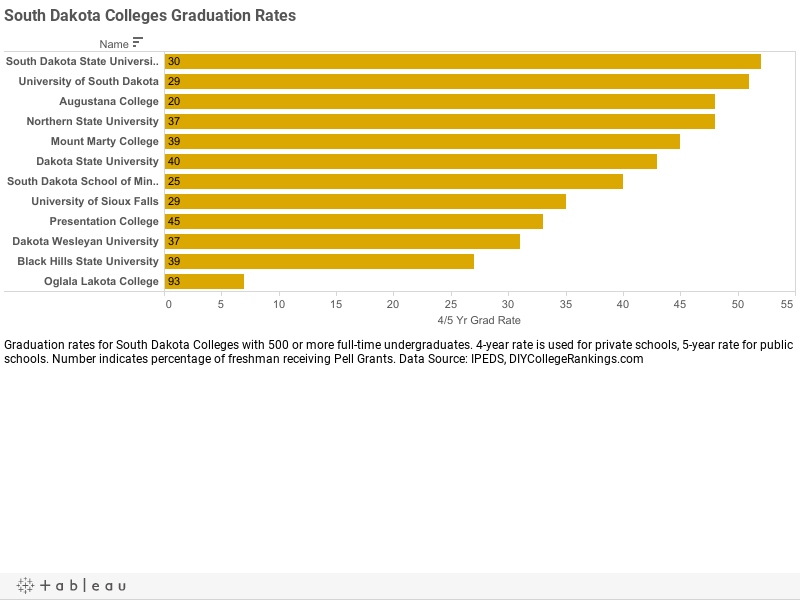 Private South Dakota colleges have an average four-year graduation rate of 38.4% and the public universities have an average five-year graduation rate of 38.3%. Two South Dakota Colleges currently meet the DIY College Rankings 50-50 profile requirements. College-bound seniors in South Dakota had an average 21.9 ACT Composite score with a 21.0 for English and 21.8 for Math. The 75th Percentile scores were a Composite of 25, 25 for English, and 25 for Math. A total of eight colleges’ ACT 75th% Composite scores were at or above this level.